Made you look! Kids will uncover their inner guerrilla artist as they sneak funny art projects into surprising places to make people smile! Marthe Jocelyn is the author of Mable Riley as well as several other novels, and the author-illustrator of a number of picture books. She lives in Canada. With bright photos illustrating the project in action, an appealing design, and easy-to-follow instructions, crafty (and sneaky) kids are going to love this—and may want to hide and catch the discoverer of their handiwork. Fun all the way around. Folks who want to create fun, temporary works of art for public places will have plenty of inspiration here...Good fun, even for those who do not consider themselves artists. From sweet to silly to sly, this collection of visual surprises will offer crafty tricksters plenty of inspiration...Set this one out and expect surprising things to begin happening soon. These projects encourage you to create art that will surprise and delight people because it’s unexpected. ... As many ideas as this book has, we bet it will spark your imagination to come up with even more. 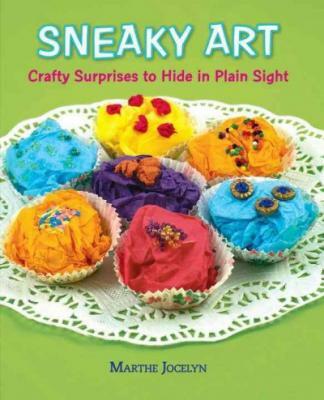 In an era of Facebook-facilitated play dates and Pinterest boards dedicated to entertaining listless children, Sneaky Art is a welcome departure from digital assistance, and will help kids graduate from the crafts table to creating, exploring and manipulating the world around them. An inventive imagination and clear instructions make this craft book an excellent resource for summer diversions. The projects are simple to execute and have a stylish humour in their finished form — and even a subversive wit at times.